THG Network (Mar. 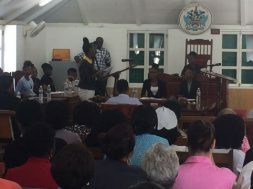 13, 2017) — The Nevis Island Assembly Chambers was full to capacity on Monday (March 13) as parliamentarians, government officials, parents, educators and students gathered for a Mock Sitting of Parliament, in commemoration of Commonwealth Day 2017. The special sitting saw secondary school students discuss the long-term care for the elderly at Nevis’ Flamboyant Nursing Home. Constructed in 2005, the Flamboyant Nursing Home is an attachment of the Alexandra Hospital. It was established to provide full residential care, respite care and day care for persons 70 years and older, who can no longer live alone and are in need of continuous care. 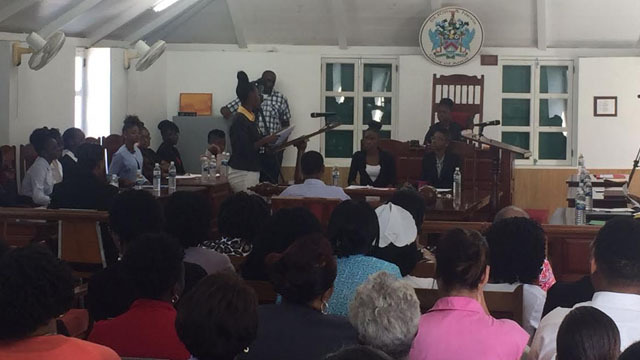 Charlestown Secondary School student Lekiah Lescott, led the debate for the government’s side. Identifying herself as the Minister of Health, Lescott focused on the physical and mental health of residents at the Flamboyant Nursing Home. In praising the successes of the home to date, Lescott said there is need for continued advancement and success of the Flamboyant Nursing Home. Meantime, when Gingerland Secondary School student Delcia Burke spoke as the Leader of the Opposition, she focused on the need for skilled nurses at the health facility. She was supported by several members of the Opposition. The young parliamentarians dissected the mock bill by focusing on the educational, agricultural and financial aspects of the home. Dahlia Slack, who spoke as the Opposition’s Shadow Minister of Finance, and her colleague Lauren Lawrence, made specific reference to the Nevis Island Administration’s 2017 Budget, which was presented near the end of 2016. Hon. Farrell Smithen, President of the Nevis Island Assembly and Clerk Myra Williams provided support to the young parliamentarians, in the lead up to today’s sitting.